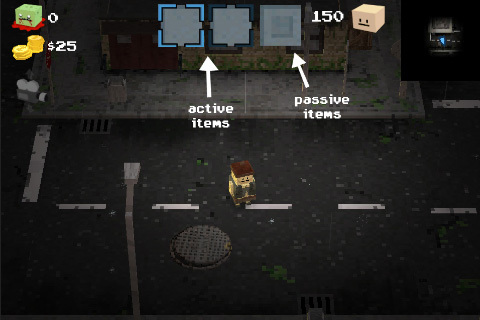 I’ve been changing some things and working on a new ‘passive item’ system. Passive weapons and items are equippable items (similar to certain special types of in-game clothing) that offer a defense/stat boost. You don’t have to do anything other than place them in the passive-item socket to reap their benefit (hence why they are considered passive). Current types of passive items include shields, protective pads, music players, bracelets, watches, necklaces and more. So for example, if you have a shield equipped, zombies that hit the shield won’t be able to do as much damage. If you have elbow pads equipped, you’ll have an overall defense boost. If you have a heart rate monitor equipped, you’ll regain a certain amount of HP for walking certain distances. 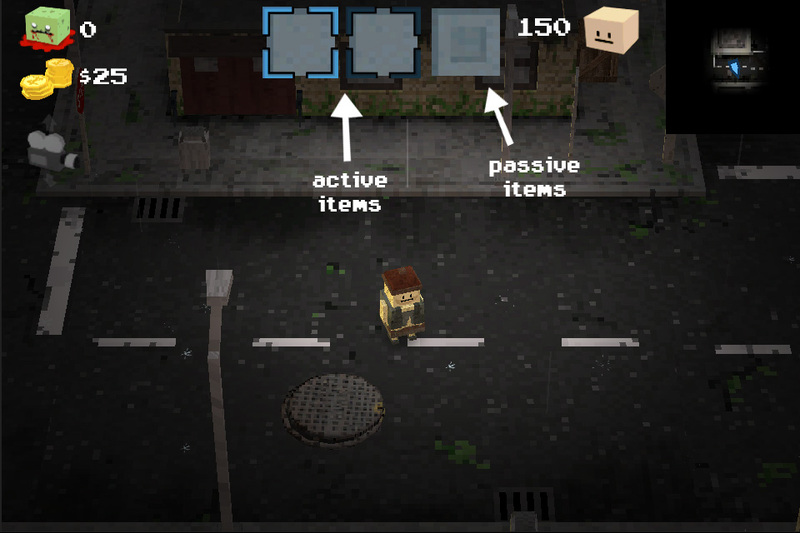 Etc etc… Each one offers a unique benefit to the player, and you’ll be able to swap them in and out like any other socketable item so you can strategically choose the best situation to use them in. Below is an image showing where they’ll appear in the layout. We want to know the release date!! Wow this is one of the most in depth iphone/ ipad games i’ve seen in quite a while!!! @ Nick: Ha ha, yeah. This game is looking great, Tyson! Way looking forward to its release. Can’t wait! Keep up the good work! Will this be released for the iPad in addition to iPhone? Amazing to see such an awesome game coming to iOS! I’m curious to know just how far the sandbox aspects will go. Will the game have a strong focus on replayability? Will one be able to play while completely ignoring any story? And does the game have any randomized aspects? ooooooooooHHHHHH random events would be awesome! I just had an idea i wanted to tell you about it is to add mini-games like skyrim when you want to open a locked chest you need to play a pick lock mini-game. so to open a lock you need to collect pick locks from houses and other places. There won’t be mini games for doing things like unlocking (right now…maybe in the future? )….but there may be other mini games. For example, there is a slot machine in one of the NPC sewers…I might turn that into a minigame that you can play to earn coins. Just going to say that the game looks like its coming along great. I’ve been following it for a while as you may remeber me from the Touch Arcade forums. And everytime I keep saying it is getting better and better. Can’t wait to see what else you have in store for us. Keep up the good work. Yep, I remember you! And I just want to say thanks for your continued support! You sir are the man! I can’t wait for this game to be released! Its kinda like project zomboid. Do you plan to have bosses in the game ? bosses seem kind of odd in a zombie based game, expecially one centered somewhat around melee combat. And even for shooting, its not very neccesary. in dead trigger, bosses were not fun at all and seemed to just be “there”. if you know what i mean. Say… there is an odd little game out there called Swoooords! that seems to share some similarities with the combat system. Could just be me though. Also, is the game actually capable of being played through yet, even just at a basic level, or is it still a way off? Woah, almost forgot my daily check-in today. The game’s coming along great, man! Ive been looking at this game and It looks amazing because this game and its developers are showing what some devices can do and the future of portable gaming. And personally ive been waiting for a zombie survival sandbox game that wasn’t minecraft. I was wondering if this game will be available on android devices? Ive been a quite observer for a long time and since i am following your blog i am getting more and more surprised what a single person can create on his own! you really deserve the money i´ll spend when i find the zombox-icon on the appstore! I’m not sure yet…I envision some NPC enemies will be “boss”-like…but I don’t think there will be boss zombies. Although, there will be varying zombie types of varying difficulty. Not sure about comment logins…I think it’s a setting in the wp-admin panel? Check under “settings->discussion”, although it might depend on what version of wordpress you’re using. Unfortunately 3gs has much smaller memory limits than 4g+ devices. Unless I can figure out a way to further compress all my assets in memory, it won’t be playable on the 3gs simply because of that. But don’t give up hope though…figuring out how to constrain the game’s memory usage is still on my todo list. I’ll post more about this in the future. I think I figured it out you were right it was in discussinos. I think it was that the person had to have a previously accepted post to comment which made it so that if they logged in they could comment but I now tried with one of my email accounts and it worked fine. Thanks! This looks like the best zombie game evaaaaa!!! !